The starting window for day two was 7-8am. They sold porridge on site and I had no trouble eating today, the bags were put on the van and we were all ready to go by about 7:15, despite agreeing the night before there was no rush. We were up and ready, so we set off in glorious sunshine. Within a couple of miles of leaving the campsite we crossed under the M62 and were riding through more pretty little villages and great countryside. My legs freed off surprisingly quickly and I was quite happy to be on the bike for another day. 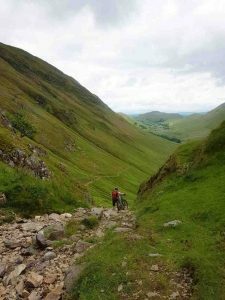 It was really noticeable how the landscape had changed, it was still hilly but there were more rolling hills than the sharp rocky landscape in the Lakes. After about 2 hours riding we started climbing along a road. Quite steep but not too bad, then we came to what looked like the top of the hill, over the brow, round a slight bend and you could see this hill disappearing into the distance with an almost continuous row of bikes in front of me. This was bigger than I was expecting, day 2 is supposed to be easier! It just went on for what seemed like hours, and then someone rode past me on a road bike and informed me I was only about half way there. It seemed like every time you went round a corner there was more of it in front of you. 2.5miles and 1100 feet of climbing later I reached the top. I’d given up and was pushing by now; as was just about everyone else. Once at the top I stopped for 5 minutes, had something to eat and admired the views; it had definitely been worth the climb! Setting off down the other side and we soon crossed the border into North Yorkshire. The advantage of having done all that climbing is we spent a long time descending. Unfortunately on roads but it made for a nice break from pedalling. Eventually we turned off the road again; climbing didn’t seem quite so monotonous off road and the descents where brilliant, even the one where I ended up going sideways round a corner (unintentionally). One of the events photographers was on hand to catch the look of sheer terror on my face as I was convinced I was about to hit the stone wall on the outside of the bend – sorry, you can’t see the photo, I wasn’t prepared to pay £10 for them to email me a copy! It was somewhere on this section that I realised how many road riders where attempting the course. You could spot them a mile off on the descents, uncomfortable and tense would probably describe them best. 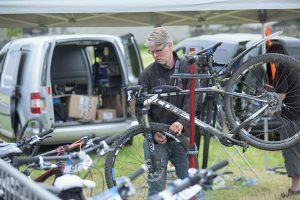 I spoke to one guy who’d only bought his mountain bike a month ago thinking that would be plenty of time to get used to the differences. He was enjoying it but couldn’t believe how tough it was, he said if he did it again he’d want a lot more practice off road! Another person who was relatively new to cycling had the right idea. 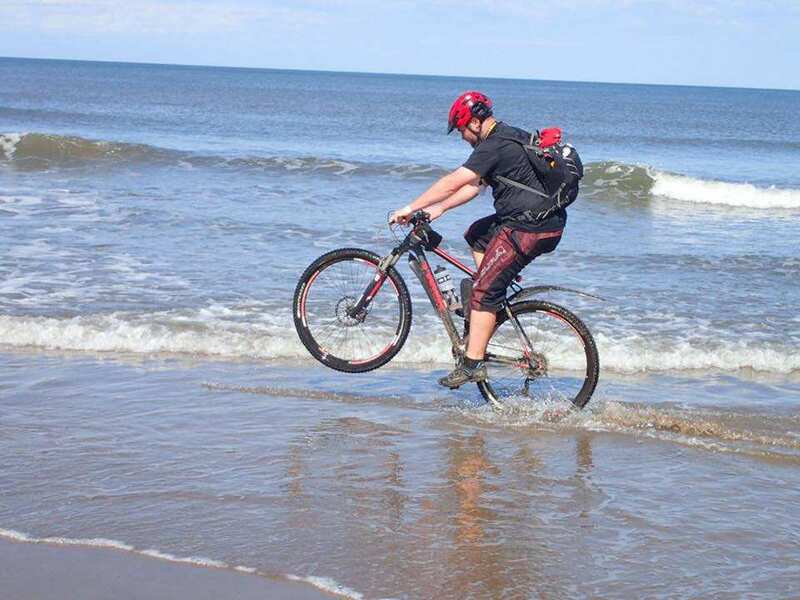 He’d spend a small fortune on a bike specifically designed to cope with this type of terrain, so why fight it? Relax and let the bike do what it does. I thought that summed it up very well and from someone who’d only started riding this year. I know people who have been riding for years and still can’t relax and let the bike do its job. The lunch stop was supposed to be at the half way mark but 35miles turned into 41 and I was definitely ready to get off and stretch my legs when I arrived. It seemed so late in the course I wondered if I’d missed it! I joined back up with Gus and Guy at the lunch stop and we set off together. Guy and I rode together all afternoon but we did abandon Gus in a pub about 10 miles from the finish. The afternoon was fairly uneventful with very little climbing and just a gentle downhill all the way to the campsite in Northallerton. We arrived about 3:30, had a massage and a shower and headed to the bar area to see how everyone else had got on that day. The general consensus, which I’d have to agree with, was that it had been a long day sitting in the saddle with too much road for a mountain bike event. It had been a case of racking up the miles quickly and it had achieved that. We’d done 68 miles and nearly 5500ft of climbing and were now on the edge of the North Yorkshire Moors ready for the last days riding. As we were so close to the town centre we headed into town for something proper to eat instead of the burgers and pizzas supplied on site. We ended up with a Chinese but were still back and in bed by 10 ready for the last day…..
‘3 Days, 2 Coasts, 1 Hell of an adventure’ – That was what the website said. So after several months of talking about it, usually after a few beers, four of us made the jump and signed up. We knew it wouldn’t be easy, 200 miles and 18000ft of climbing over 3 days, so we’d all need to get some training in. The four of us managed this to varying degrees; Gus got the most miles in, several 50+ milers and at least one 100 miler that I know of. 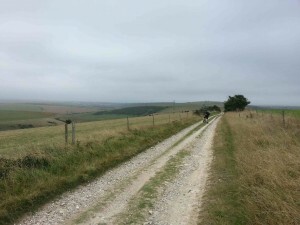 Guy was regularly riding the 30 miles round trip to work over the Downs and he focused on hill work. I did a little bit too, but other commitments and several motorcycling holidays got in the way. On the drive up to Scarborough it occurred to me I’d only ridden over 50 miles about twice in the last few months and I’d only done one fairly small back to back ride. Not ideal but I’d done what I could so I’d just have to go for it and see how I got on. The fourth member of our team however had the best solution. Dave, having been the main instigator in signing us all up for this challenge in the first place, jumped off his bike at low speed a couple of months before the event and had to pull out injured…..
We had agreed to drive to Scarborough on the Thursday and take advantage of the bus transfer to the start line in the evening, so that the car would be waiting for us at the finish line. An early start meant I had to load up on the Wednesday evening. I arrived to find Gus and Guy in the shed trying to re-seat Guy’s tubeless tyre on the rim. About half hour later and with us all covered in Stan’s sealant it was finally done and the car was loaded with no more issues. Thursday morning I was picked up at 6:20 and we headed north, arriving in Scarborough with about an hour to spare before the transfer. 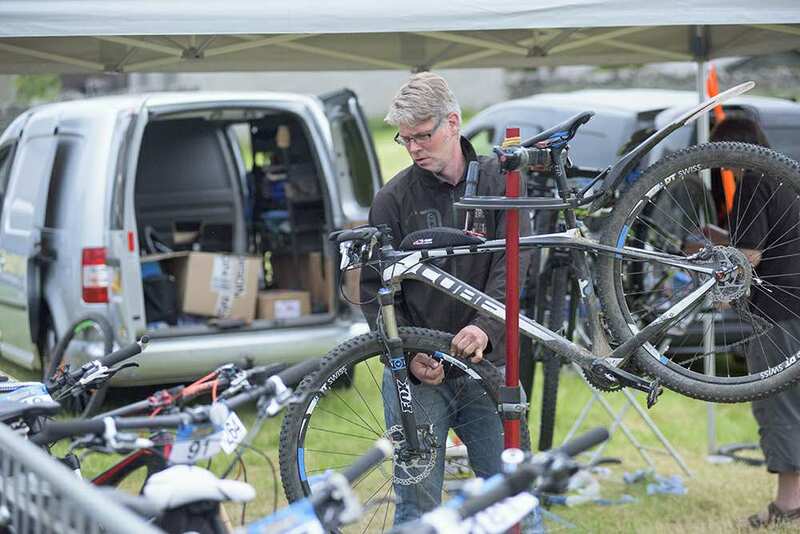 We had to pack our bikes into boxes and load them onto the back of a truck for transportation to the start line. This meant removing wheels, pedals and rotating handlebars, so by the time we were finished it was time to get on the coach and head across to the start line. This is where my first tip for an event like this must come in. If you are on a coach travelling from the finish to the start line, don’t look out the window! The hills kept getting bigger, the sky got darker and it seemed a bloody long way on a coach. What was riding it going to be like?! By the time we arrived at the start, in Whitehaven, it was raining and I was feeling quite apprehensive about the whole thing for the first time since signing up. The biggest issue for me was that no matter how many times we checked the weather forecasts, and how many different websites we looked at for them, they all said we were going to get wet… very wet! Nevertheless, we unpacked and racked our bikes, signed on, found our B&B, ate and got an early night. I woke up early the following morning having had a terrible night’s sleep, I was in an attic room with no window and the noisiest fan I’ve ever tried to use (I was up at 1am using my bike toolkit trying work out why it was so noisy and fix it!). It was like a sauna, and I sat there listening to the rain dreading the day ahead. I went down for breakfast but couldn’t eat it; I think it was a combination of a dry mouth, sore throat and nerves. I never get nervous, what’s going on?! However, from this point on our luck somewhat changed and as we walked to the start line about 5 minutes away the rain eased off; by the time we got there it was a fine drizzle. Pretty miserable but I could live with this. We checked our bags in as they would be taken to the overnight stop at Shap by van. We got our bikes ready for the off and took the compulsory picture with the back wheels dipping in the sea. We got called over for a quick rider briefing and we were off at about 7:10. The rain had almost completely stopped and all 3 of us had decided to put our jackets away and chance it in jerseys and shorts. The first mechanical problem we saw was, at most, 50 yards from the start line. Fortunately it wasn’t one of us but you had to feel for the guy pulling over to repair a puncture so soon! We did about 10 miles gradually climbing out of the town on a tarmac cycle path (disused railway line I’m told). It was a staggered start and we were in about the 4 th or 5 th wave; we seemed to be overtaking a lot of people already which felt good but it did make me wonder if they were saving themselves and knew something we didn’t. You could see the hills looming in the distance, often disappearing up into the clouds. Impressive, but knowing we would soon be riding over them was a little daunting. At about the 10 mile mark we turned off the road and up a short, sharp, gravely climb. Once at the top of this climb there was an amazing descent that looped along the side of the hill. It was technical in places with some very fast sweeping sections. This is my kind of riding; I was overtaking a lot of people and was now really starting to enjoy myself. I finally had the answer to the question I’d been asking for the last day and a bit – Why am I doing this? The morning section provided a few more climbs, some more great descents and some absolutely incredible views! The three of us got slightly spread out but it didn’t matter as there were a lot of people around, so you were never really on your own. 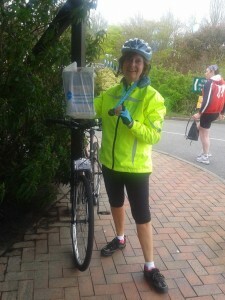 We made very good progress on that first morning and arrived at the ‘Pit stop’ in Keswick about 10:15. We’d been warned there was a huge climb straight after the stop so we grabbed some food, and set off. We were in the pit stop for about 8 minutes, long enough for a breather, but not long enough to start stiffening up. Back on the bike we started the climb out of Keswick, firstly on the road then onto a track that I don’t think anybody rode up. It was too steep, rough and loose to get any traction, so it was a long push to the top. The view at the summit made it all worthwhile though and the descent on the other side was great fun. During the descent I came across a couple of guys with a puncture who had no idea how to repair it. The bike shop had set the bike up for them and they didn’t seem to have any idea how to repair a tubeless tyre. We agreed the best thing to do was to just put a tube in it so they could keep going, so I gave them a hand to get the valve out and left them to it. This must be tip number 2. When riding a mountain bike, carry a toolkit and make sure you know how to use it! You’d be very lucky to do a trip like this and never need to do anything! By now I was separate from Guy and Gus again; my lack of training and slow climbing of the hills meant they left me behind. I continued to make good progress until I came across what can only be described as a mountain to climb. I’m not exaggerating; much of it was too steep to even push your bike up. People had them over their shoulder and carried them up the side of this mountain. It took what seemed like an hour to get to the top. And when we got there the other side was the same, bike up on your shoulder and climb down the other side. It took me just over 90 minutes to clock up just UNDER 2 miles. I’m afraid I couldn’t see the point of that part of the route, especially when locals said there was a nice route to ride round it. It was an adventure alright, but my back was aching from carrying the bike and my ankle had gone over on a loose rock and didn’t feel too clever. It could have been worse, once we were back riding the bike a guy in front of me got caught in a rut and had a big crash. We told him to get up, gave his bike a good check over and carried on. He seemed okay but was checked out by a first aider on the route. I understand he finished the day (and event) without any further problems. Once over the mountain the rest of the day was fairly uneventful. My only other issue was that I ran out of water, the only water station of the day (other than the pit stop where I didn’t fill up as I thought I had plenty) was 58 miles into the 68 mile leg. It struck me as a bit late and other people obviously agreed as the organisers had a few complaints and rectified it for the rest of the weekend. I arrived in Shap at about 15:30 under glorious sunshine. Day 1 had been 68 miles and 8000ft of climbing! Amazingly, it had stayed dry all day and the cloud cover had kept it fairly cool. Absolutely ideal riding conditions. A recovery shake, 20 minute sports massage, hot shower and well-earned beer followed. We’d been told the first day was the hardest and I’d not only survived it but actually really enjoyed it. Two more days of this and I’d be a very happy man. My lack of training hadn’t been as big an issue as I first thought it might be. 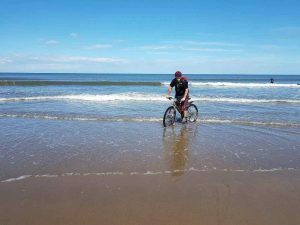 I spoke to one guy who’d done one commute to work all year and this was the second time he’d been on a bike. There were also people still arriving with minutes to spare before the 8pm cut off. I wasn’t really anywhere near the back. 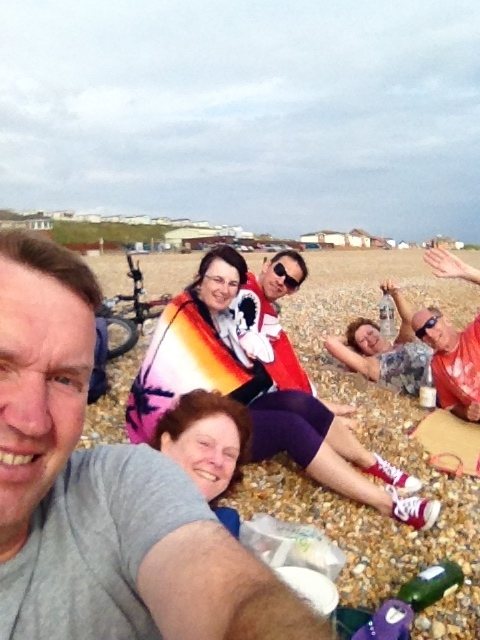 We ate outside the beer tent in the sun and were in bed by about 9pm ready for the next day’s riding…..
Run, walk or cycle our local Downs in aid of the British Heart Foundation. There are two cycle routes, 20miles or 30 miles, on routes that are often used by Cycle Seahaven. Organised by Seaford Martello Rotary, registration opens in The Salts at 8am, with the first departures planned for 9am. During last year’s glorious summer I was persuaded by some good friends to dust off my old rusty mountain bike and join them for some short cycle rides to the beach where we enjoyed some wine and a bbq or two. I enjoyed the cycling so much and was looking for a new challenge so in a moment of pure madness I decided to sign up for the London to Paris Bike Ride which will take place in April this year. Having committed myself I then realised that this was in fact a huge challenge and I was going to need lots of support and advice to get me there. 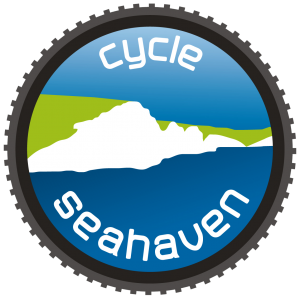 I had heard a lot about Cycle Seahaven so decided to contact them with the intention of joining. My first ride was a Thursday night pub ride where I met some fabulous people and had a great night out. I have since been on many Thursday night rides and have also enjoyed a number of Sunday mtb rides. The London to Paris ride is all on road so I needed to purchase a new road bike (something I have never owned before) and after discussions with the boys at Mr Cycles, Seaford I came home with a lovely shiny Giant. I also needed to start training on the roads to get my road mileage up and so I joined the Sunday Touring Club Ride and the Tuesday Touring Ride both led by Clive. 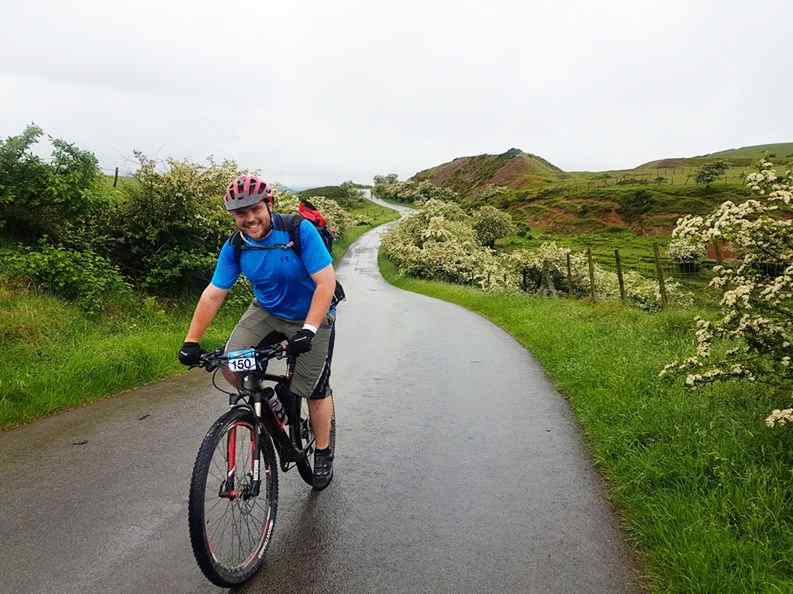 Cycle Seahaven has given me the opportunity and support to prepare for my challenge and without their help and advice it would have proved incredibly difficult to achieve. In addition, I have had some fantastic fun times and have made some great friends. I was looking for a new challenge but in fact have found a new hobby which will last a lifetime. 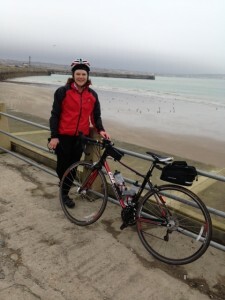 The purpose of my challenge of cycling from London to Paris is to raise awareness and funds for a charity which is very close to my heart – LUPUS UK (charity no 1051610). Lupus UK is the national charity that helps those with systemic lupus and discoid lupus. If you would like to support me in my challenge you can visit www.doitforcharity.com/JBarlow and make a donation. Alternatively I am hosting a Dinner and Quiz night on Wednesday 8th April at the Hampden Arms in South Heighton. This is a ticket only event and tickets are on sale now for £12 per person from The Hampden Arms or the office at Three Ponds Holiday Park. Teams of up to 6 people and dinner is a 2 course set meal. 4am is never an easy start to a full day of cycling, but with a belly full of porridge and a well prepared bike I rode the half-mile from my house to meet up with Marina and Chris Sparks for the drive to London. We picked up Jim Wells and Simon at Pease Pottage and drove onto the start at Roehampton University, SW15, arriving around 7am. Chris and I were both running singlespeed (no gears) mountain bikes, and we’d had much discussion on the best gearing for the journey – high enough gearing for the long flat sections, but low enough to tackle the climbs. We’d gone for similar ratios on our 29inch wheeled bikes. I’d gone for 34:18 and Chris had gone for the slightly higher (harder) gear of 32:16. I’d opted for the comfort of front suspension whereas Chris had gone for the lighter but more tiring option of rigid forks – respect! We were both keen to see how our choices would play out over the next 125km. We soon arrived at the gates of Richmond Park and enjoyed a leisurely paced through its rolling landscape and green spaces. That’s the problem with singlespeed bike – unless you pedal furiously you are limited to a single speed. No problems to be had with Trade Descriptions, then. We were overtaken by quite a few riders, but we were happy at this forced speed restriction as we felt it would save our legs for later – tortoise and hare style. A third the way through Richmond Park a stag decided to walk right towards us with the intention of crossing our route. Those animals are big and the mass of spikes on its head were not at all comforting. Luckily it slowed a bit and we passed just in front. I didn’t dare look back, but I guess it must have stood in the road because we weren’t passed by other riders for quite a while after. We left the park and followed the Thames Cycle Track on through Hampton Court Park (10 mile mark) and onto the first water stop at Weybridge, 15 miles into the ride. This was my first supported event and I’d never considered how water would be delivered to 3000 riders. The answer was an ingenious use of a large water boswer connected to a pump and two rows of four push-taps over a large sink. It reminded me a little of a communal urinal. I’m glad I had some fruit flavoured energy powder to mask any stale taste there may have been. A lot of thought had gone into our nutrition. My approach was to carry the aforesaid high energy powder: it was light to carry and would be mixed with the water that was available from the bowsers every 15 miles or so. This high-tech food source was supplemented by some decidedly low tech chocolate covered biscuits and three of my favourite Tunnocks Caramel bars. I had planned on the ride taking around seven hours so I took 8 sachets of powder, one for each hour (or ten miles) plus a spare. I also took two energy gels, also for emergencies. I’d never tried one before so I left them for last, just in case they didn’t agree with me. I also took a couple of high-tech energy food bars. I didn’t like them as I found them too dry, so I’m really glad I took the choccie biccies. We joined the road to Byfleet then, after what seemed like ages on tarmac (this was after all an off-road challenge) we got onto some real ‘singletrack’. 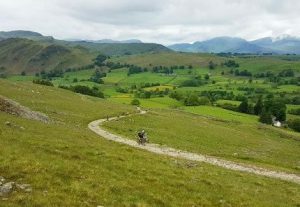 This is where the singlespeed bike came into its own – ascending climbs and tackling dirt trails at a confident and steady pace, reigning in the road warriors from earlier. I’d lost the others by now, as I was having too much fun playing in the dirt trails. 30 miles in and we came across the first real technical challenge –a very steep descent on slippery, rutted mud. I’m pleased to say that I passed a lot of people on this section, and made up plenty of ground. I love my singlespeed! At the bottom of this descent was our second water stop. I refilled both my bottles (500ml and 750ml) and topped them up with three sachets of powder. I had used up three sachets in the last thirty miles, so my plan for one every 10 miles seemed to be working. Taking a regular supply of water and fuel is a key skill in long distance riding, and I’m glad I seemed to be keeping to the plan. I had no idea of timing as I wasn’t racing – just keeping a steady pace and keeping myself fed and watered. Luckily Chris appeared before I was ready to leave, and he too was grinning from that technical descent. We had already agreed not to stop. If we needed rest then it’s better to keep active – either walk for a bit or pedal gently. This method of ‘Active Recovery’ has worked for me on other long-distance rides, and we were keen to put this into practice; we were both fired up for the next 45 miles. More bridleway was followed by a narrow path through heathland. The narrowness appeared to make it difficult for some riders, and with nowhere to pass many of us were obliged to ride at a slower pace. This is not usually an issue because one can simply select a slower/easier gear. Chris and I didn’t have that option, so the going was quite hard for what should have been a relatively easy section. But hey, it’s all part of the fun. At the 40 mile mark we refilled with water and joined the Downs Link. I’d only ridden a short 3 mile section of this before, and I was surprised at how long and flat it was. This would make a great venue for a club family ride. 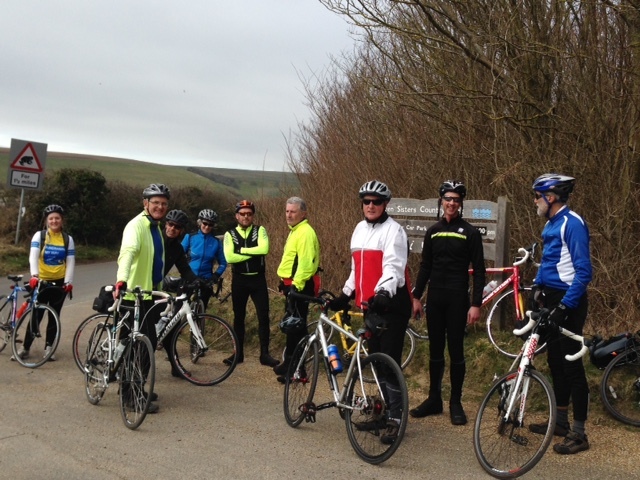 We took in about 20 miles of relatively easy cycling all the way to Steyning, then a short hop to the water station at Bramber. The burger van smelled fantastic, but I knew that a stomach full of fried onions and minced beef would do me no favours on the climb up Truleigh Hill. I’d lost Chris again – he had hit a wall about 50 miles in but luckily recovered for the final stretch. I decided to press on but not before trying my emergency energy gel. I have to say it was disgusting, but I know that some people swear by them. I was swearing AT mine. This particular gel had caffeine added, which I hoped would help me up the brutal climb to the top Truleigh Hill, but all it seemed to do was raise my heart rate to bursting point. I didn’t make the hill in one go as intended but I was determined to cycle the whole route without walking. It took me about seven stop-start goes to climb the steep, rocky section before Freshcombe Farm, but I managed to cover the entire climb on my bike instead of beside it. I knew that this was the last push so I attacked the remainder of the hill with much of my remaining energy. At last I’d made it to the top. Cresting Southwick Hill, with its views over Mile Oak and out to the sea felt amazing – it’s all downhill from here. 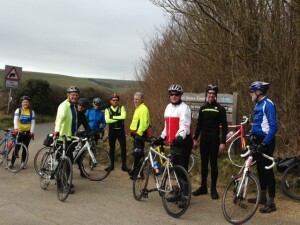 I really enjoyed the descent on the narrow and uneven track, over the Southwick tunnel and down to the Old Shoreham Road. The lights changed in my favour as I approached the crossing so I tucked in and kept my downhill speed to the harbour and down to National Cycle Route 2. The flat and relatively boring ride along the cycle path on Hove prom was a chance to slow the pace and try to warm down, but my spirits rose as I saw the huge inflatable marker at the finish-line on Hove lawns. If I had gears I would have tried a sprint finish, but forced to ride at a steady pace allowed me to bask in the glory of the lovely welcoming crowd – what a brilliant feeling as you cross the finish line with people cheering, flags waving and a congratulating party to present you with a medal. I felt like I could do it all again. Well, it felt like that for five minutes. It was 14:14 and I’d been cycling almost non-stop for nearly seven hours. Chris was not far behind on his rigid singlespeed, crossing the line and grinning to the same amazing welcome. Fortunately there was no beer tent otherwise we’d have both got steadily smashed. Instead we rode along the prom and under-cliff to Ovingdean where Marina was waiting to ferry us back home. Well, not immediately home but back to the pub for a swift one. By the time we finished our pint each the adrenaline was wearing off and the need for a hot bath beckoned. It was only late afternoon and Chris was already planning the next daft thing to attempt. I declined to offer any suggestions, too tired to play that game. What a day, though. 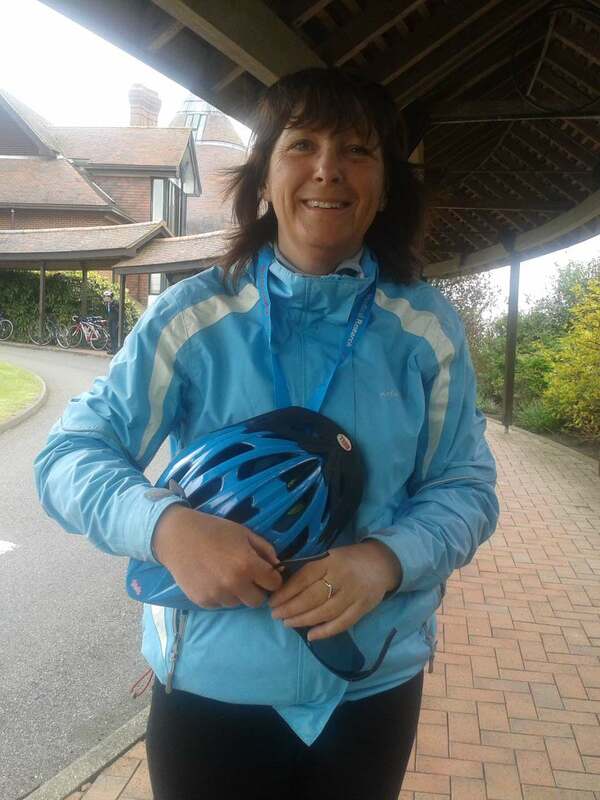 A little publicised all female cycling event Action DIVA in aid of Action Medical Research for Children took place at the weekend, promoted by Davina McCall. Jill Spencer, Club Secretary and Jo Homan, Club Member, had been training in cold and windy conditions for many weeks in preparation. At the start line Davina McCall donned her shoes and led Jo and Jill, the last group of starters, from East Sussex National Golf Club at Uckfield. A privilege that many a gentleman would have envied! “We started in neat single file until the first descent and then short climb when the pack split and it was every woman for herself. The weather was just bearable, a brisk easterly wind prevailed, rather than a mild May breeze that might have been expected. We stuck together finding our own comfortable pace and started to enjoy the scenery even chatting from time to time. It had been a challenging ride mainly because of the windy conditions and the fact that Jo had not ridden such a distance for about 12 years and for Jill it was a first. Despite the virtual gale force 10 breeze, Jill and Jo managed to complete the 40 mile route in just over 4 hours. 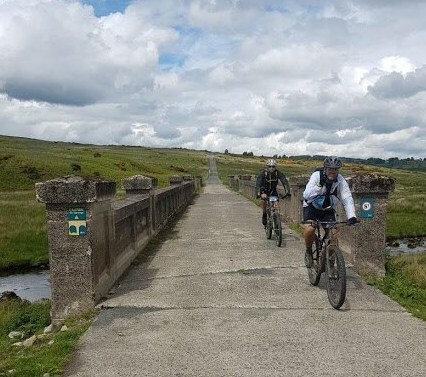 The event was brilliantly organised – including a feed station half way round with goodies and high energy snacks for the riders as they started to lose energy! At the end of the route all riders were presented with goody bags and a medal! Sponsorship money is still coming in but at the moment Jo and and Jill have raised somewhere around £400 between them for Action Medical Research. It is not too late to sponsor them! Please visit their sponsorships pages to chip in for a worthy cause.